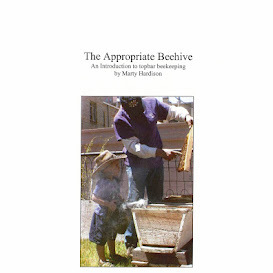 Backyard Bee Hive Blog: If you are buying bees for 2012, buy them NOW! If you are buying bees for 2012, buy them NOW! 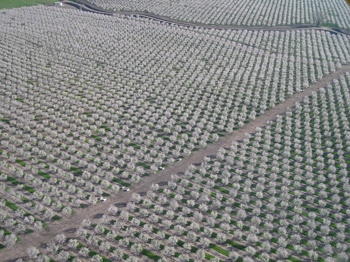 This almond orchard reminds me of the graveyards in Queens. For nucs, try to find a local producer. My goals as a beekeeper are confined to sustainability and survivability (not honey-production, not gentleness on the comb, not non-stingy/swarmy...) so a local queen is important to me. I lucked out with Grampa's Honey, which is selling nucs with Survivor queens, as well as Buckfast, Carniolan and Italian queens. I'm almost positive they are chem-free beekeepers, and they're not coming out of the almonds, which is a big plus IMO. ZiaQueenBees is definitely chem-free. They'll start taking orders soon and they WILL sell out. If you're in Durango, while not treatment-free, ApisHive is a new option for top-bar nucs (pick-up only). Scientificbeekeeping is not local to me but Randy Oliver's northern CA nucs are notable. Like ZQB, he's producing some with proven, fat queens. ZQB says overwintered queens are Cream of the Crop! If you plan on starting with a swarm, contact your local beekeeping club and get your name on their swarm list. If they haven't started their list yet, ask them when they are and call again then. Swarming season won't start until April, but it's first-come first-served so you want your name at the top of the list. Your bees will have a lot of work to do. If you are starting with mason bees, order them NOW, too. There are not a lot of suppliers, so what's available sells out. We bought our Blue Orchard Bees last February from seemingly the last available anywhere, at USABirdSupply, and are very happy with what we received, house and all. But had we planned earlier we would've bought from MasonBeesForSale since they have BOBs that are a "hearty mountain bee" in the correct ratio of male to female cocoons. And for my last bit of advice, be sure to check retailmenot for discount codes whenever you shop online. P.S. Thanks, TB, for inspiring this post.